Spectacularly situated on more than 1,200 wildly beautiful acres in scenic Central Oregon, WorldMark Eagle Crest invites guests into a world of incredible resort amenities, magnificent vistas, endless sunshine and unparalleled outdoor recreation. This award-winning Oregon timeshare is nestled in the dramatically beautiful Cascade Mountains, surrounded by some of the west coast’s most incredible four-season outdoor playgrounds. Head out for on-site fishing, swimming or golfing in summer, or thrill to amazing skiing and sledding in winter; then, at day’s end return to the cozy cocoon of your spacious Eagle Crest timeshare. Browse our incredible selection of WorldMark timeshares for a chance at a dream vacation every year at jaw-dropping prices. Stay in style when you rent or buy a WorldMark Eagle Crest timeshare. Exquisitely appointed one-, two- and three-bedroom condos and chalets feature stylish contemporary décor, high-speed Internet access, DVD player, cable television, gas barbecue and stereo sound system. Units may include spa tub in the master bath, hot tub on deck or in-unit washer/dryer. Savor a morning coffee or evening cocktail on your own private balcony or patio while drinking in the stunning river and mountain views. Après ski activity at your Eagle Crest timeshare can be as simple and comfy as curling up around the gas fireplace with a glass of wine or a good book. 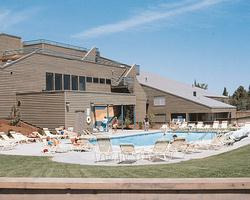 This Oregon timeshare offers all the amazing amenities of a full service resort, with on-site shopping, pampering health spa and three state-of-the-art fitness centers. There’s never a dull moment with incredible on-site recreational facilities including a racquet ball court, beauty parlor, indoor pool, three outdoor pools, tennis courts, game room, five hot tubs, indoor sports court, equestrian center, bike rentals, pro shop, café, two driving ranges and three golf courses. Seasonal children’s activities keep the little ones happy and occupied, while Niblick and Greene’s restaurant offers classic American cuisine, pub favorites and live music. Offering a true holiday heaven for outdoor recreation fanatics, the area around this incredible Eagle Crest timeshare is packed with an astounding array of exciting activities. Spend an invigorating day fly fishing along the Deschutes River or head out for some challenging hiking, rock climbing or mountain biking among dramatic cliffs, meandering riverbanks and scenic juniper forests. With two championship golf courses, a new par-63 challenge course and a fun-filled 18-hole live-turf putting course, this superior Oregon timeshare can keep any golfer happy for weeks. When the snow flies, nearby Mount Bachelor offers top-notch skiing, snowboarding, sledding as well as over 30 miles of groomed cross-country skiing trails. A unique low elevation means you may be able to ski in the morning and golf in the afternoon. WorldMark Eagle Crest is situated close to a wealth of scenic natural sights including spectacular Smith Rock State Park. Stay active outside or head to local attractions like the High Desert Museum, featuring unique displays showcasing the region’s people, history, plants and wildlife. All of this outstanding vacation activity can be yours by looking through the terrific options to rent or buy a WorldMark Eagle Crest timeshare here at BuyaTimeshare.com. Because we offer vacation deals on the timeshare resale market, you can save 50-60% off the retail cost offered through the resort. Get in on the action by checking out the timeshares for sale or rent and start planning your next vacation today. Contact WorldMark Eagle Crest Specialist Today!